This posting is adapted from an article which originally appeared in Antique Week. Determining the worth of miscellaneous old silver-plated flatware is a question that perplexes the general-line or occasional antique dealer. Individual pieces are seen at antique shows at prices as high as $75 to $150. Other individual pieces can be found in the junk box at the Goodwill store for a quarter each. As a specialist in American silver-plated flatware, I have had to learn how to evaluate flatware on the fly at shows, auctions and flea markets. Suppose you are standing at a flea market looking at a pile of silverplated flatware. There’s a lot of it, and the asking price is modest. Is it a good buy or not? It’s a good buy if you can sell it at a profit without too much effort and a terrible buy if you are going to own it for the rest of your life. 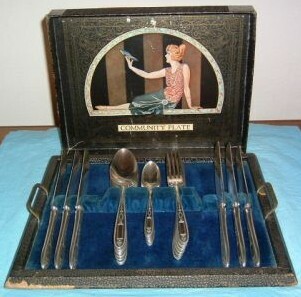 Production of silverplated flatware began in Connecticut in 1847. Connecticut continued to be a center of production, although considerable amounts were also produced in Massachusetts and Rhode Island. 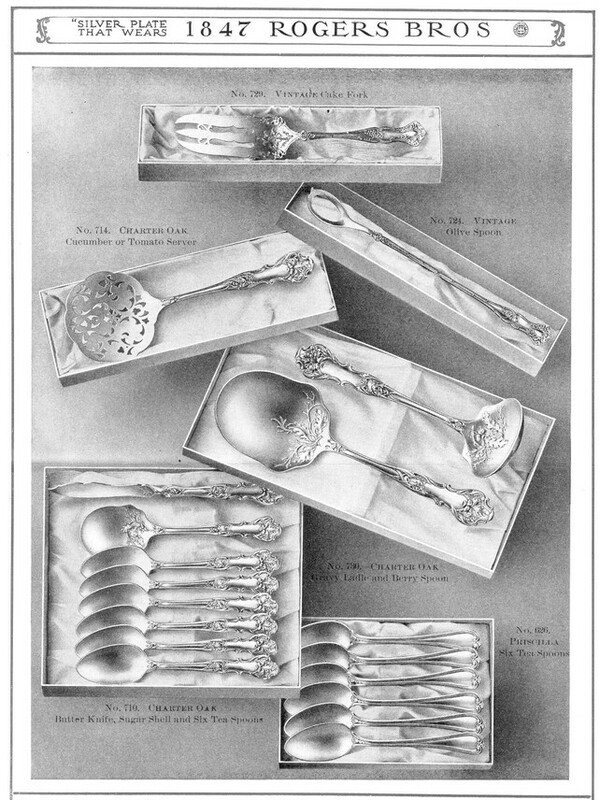 Although some production continues today, silverplated flatware was most popular between about 1870 and 1950. During this period more than 2,000 patterns were introduced and a great variety of place and serving pieces were designed. 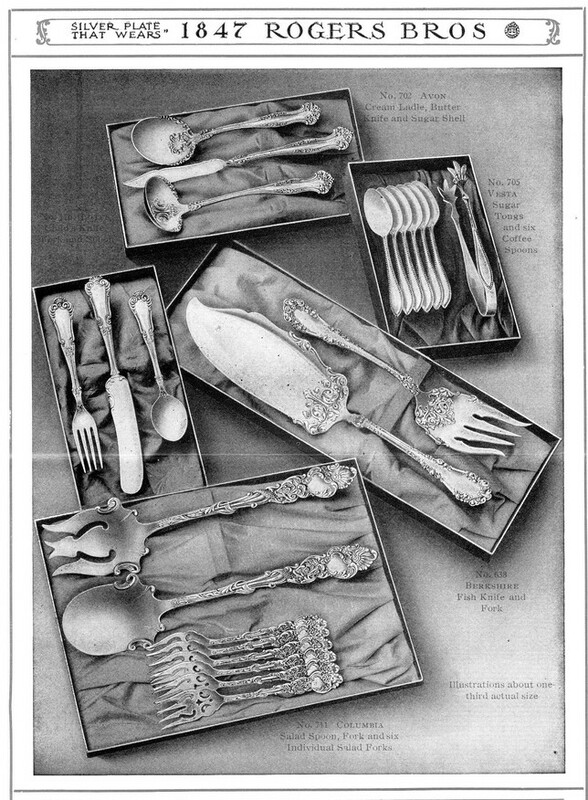 Doris Snell, in her book American Silverplated Flatware Patterns, lists 200 collectible pieces of flatware, from A (almond scoop) to W (waffle knife). In between you have such wonders as asparagus tongs, crumb knives, and lettuce forks. The information is helpful, but incomplete. Regional variations in demand exist Further, some patterns have what is called a “thin” market, that is, so few pieces are available to buy or sell that no reliable price levels can be established. In general, the most salable patterns are those which there is both a steady demand and reasonable supply. Check the mark. Certain marks denote quality, including anything by Gorham or Towle, the Oneida Community mark, and the 1847 Rogers Brothers mark by International Silver. Many reputable companies also made lower-quality plate with obscure marks like Vanity, Melody, Carlton. Avoid these unless you are sure of a demand for the pattern. Check the age. With a little experience handling flatware and studying reference books, you can learn to identify the period by the style of the pattern design. Collectors pay the most for patterns from the period between 1890 and 1910. Customers who are filling in inherited sets seem currently to be most interested in patterns from the 1930s through 50s. Is it fancy? Collectors like ornate patterns with lots of detail. Look for the less common pieces. Even in an uninteresting pattern, you will find demand for sets of ice cream forks or for the unusual like poultry shears, sugar sifters or long-handle pickle forks. Silverplated flatware is fragile, much-more fragile than sterling. Each piece is made up to two elements: the pure silver plating on top and the non-silver blank underneath. The pure silver which makes up the plate is much softer than sterling – the copper which is added to sterling makes it into a tougher alloy – so the surface of silverplate is more easily rubbed, scratched, or pitted. Damage to the plate is expensive to repair. Currently in Connecticut, I am paying up to $7 to replate a teaspoon. With a retail price range for teaspoons of $4 to $15, this is seldom profitable. Damage to the blank – the base metal knife, fork, or spoon under the plate – is almost impossible to repair. Pieces with deep scratches, dented knife handles, worn down spoon edges, shortened or uneven tines cannot be sold at any price. Tarnish results from the interaction between the silver and the air and is not damage. Tarnish may actually be protecting the surface, and you may come to admire the even, almost oily tarnish which may conceal a perfect surface underneath. Be suspicious, however, of an uneven tarnish. Spots or patches may reflect worn plate underneath. Flecks may be pits, that is, erosion through the plate and into the underlying blank. Use your fingertips to check surfaces and reject any which are rough. Your flatware buyer may be a collector, but it is possible your buyer is a retail customer buying a set to use or supplementing an existing set. Your buyer may also be another dealer or wholesaler. – Generally collectors pay the highest prices, but they are picky. They want the unusual and they want the perfect. Some collectors collect by period. Currently, for example, I have customers looking for flatware in patterns from the aesthetic period of “Japanese taste,” about 1875-1880. Other collectors like a pattern because of the range of interesting pieces that it offers. The Vintage pattern (1847 Rogers Bros., 1904) remains popular because it gives collectors the opportunity to look for the many interesting serving pieces made in it. Still other collectors like a design idea or theme. I have met grape collectors, strange serving piece collectors (the serving pieces were strange, not the collectors), and self-described “bowl freaks.” Items sought by collectors can command high prices at antique shows, individual shops and malls. Complete flatware sets can also be sold at shows, shop and malls. Retail customers buying sets may or may not be interested in the collectibility of the pattern. They are always interested in the completeness of the set, its condition and the possibilities for expanding it in the future. The buyer of a set may compare its price with those of new sets at the local discount store. A dealer selling such sets needs to be knowledgeable about the superior design and quality of flatware from earlier periods. Retail customers completing or expanding sets are often looking for patterns to match those they have inherited or put aside for some years. Sentiment plays a definite part in these buying decisions. As a general-line dealer, your chance of having just what such a person is looking for is not great. I have more than 20,000 pieces in inventory, and I can’t meet the majority of retail match requests I receive. You can improve your chances of success by concentrating on generally popular, high-quality patterns and pieces. Retail flatware matching services are offered by some large, nationally advertised companies. Some dealers find it worth while to wholesale to these outlets. In addition, a number of small flatware matching services sell to both retail customers and other dealers by mail. These flatware matching services are another possible market for the general-line dealer who has flatware to sell. Let’s go back to the flea market where you have been considering the pile of flatware. A quick count reveals 50 pieces, and the asking price is $25. At 50 cents each, how can you lose? Before you start to dicker, look again. Reject three knives with dented handles, seven forks with scratched or worn down tines, a dozen teaspoons with heel wear, and a gravy ladle with a pit. The remaining 27 pieces are in fine to excellent condition. Reject the five pieces marked “Madrid,” an obscure mark. That leaves 22 pieces. You are now ready to look at the value of what you may be buying. Of the 22 pieces, six are bouillons in the same pattern. The pattern is unfamiliar but they seem to be from the 1920s and are marked Oneida Community. As a set they would retail for about $4 each and wholesale for about $2 each. Four forks are in the desirable Charter Oak pattern. They will retail for $8 or more each and wholesale for about $5. Ten miscellaneous teaspoons would retail for about $3 each or wholesale for about $1 That leaves you with two serving pieces: a sugar shell and a pastry server. Both are unknown patterns, but the sugar shell has a very fancy bowl with a flower in it, while the pastry server is clearly a pre-1890 design with an engraved blade. Since it is ornate, the sugar will retail for at least $6 (more if a collectible pattern), while a pastry server from this period retails for $20 or more, again depending on the particular pattern. Wholesale would be about half that. Although we have recognized only one pattern, we have used our knowledge of flatware to establish a wholesale value for the pile of about $55 and a retail value about $112. Is this flatware a good buy at $25? How much you will make depends on what you think your time is worth. To realize full retail value will require polishing, taking the flatware to shows and contacting customers by mail or telephone. Even so, the teaspoons and the bouillons move slowly. As a worst case, assume you can wholesale the Charter Oak forks and at least one of the serving pieces almost immediately. Since this would return your investment, your only risk then will be how much time and effort it will require to make a profit. I don’t know where to see if my silver plate flatware is worth anything. I thought it was sterling silver till a company looked at it today and said it was plated. I inherited it after my parents died. I have never used it and I don’t think they did either. It has to be dated between the 1930’s and 1950’s and it over 100 pieces in almost pristene condition. It says Made in England and has a EPMS stamp on it numbering each piece and I looked it up and apparently it is Sheffield. Where do I go next to find out its value? I cannot offer you much about English silverplate as I do not have either the experience or much reference material. The mark is EPNS which means electroplate on nickel silver. It is technically not the same as Sheffield Plate. I suggest you find some dealers in English items and ask them for advice. It partly depends on what your idea is of an esthetic pattern. I would enjoy to have a Esthetic period pattern identifier. Can you tell me where to get one.